another image of the power suit. Power Suit, definately. I like the "Battle Suit" look better than the "Jump Suit" look. Fusion Suit. The weight lost from taking away some of the Power Suit's parts should allow her to go faster, and she could use those spikes on her arm as a melee weapon. Plus I think it looks pretty cool, except for the color schemes. My only real gripe with it is the awkward wall-jumping. if the fusion suit was red and black and orange it would be awsome. Quoting Zeta: Fusion Suit. 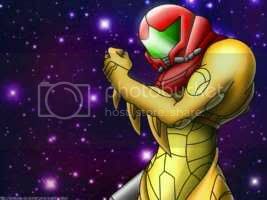 The weight lost from taking away some of the Power Suit's parts should allow her to go faster, and she could use those spikes on her arm as a melee weapon. Plus I think it looks pretty cool, except for the color schemes. My only real gripe with it is the awkward wall-jumping. Oh whoops. I meant just the Varia Fusion color scheme. The purple and yellow just looks so ugly, IMO. Gravity Fusion FTW. In terms of capabilities, there isn't much separating the two... Though I have to agree, the Fusion suit looks better, in my opinion. A more streamlined design - the colour scheme of the power variant looks garish, but the SA-X powered version seen in the closing scenes of the game completes the look. I also like the idea of the arm spikes being used as a melee weapon, or perhaps a form of wall-grab? 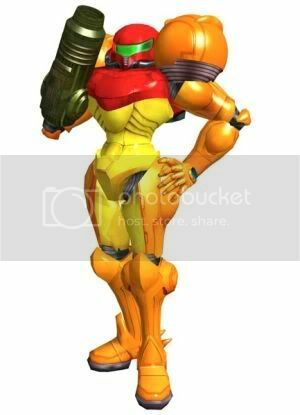 I'll vote Zero Mission suitless Samus.